The ancient town, precisely being a fortress,was surrounded by powerful defence walls which can still be well recognized, in spite of the large tampering it suffered, all around the old town centre. They were the so called megalithic walls which, by integrating with the natural defence made by the Rock, protected the city on the other sides along the coast. These walls, together with the Cathedral, are the most characteristic feature of the town, and they must have served the above mentioned purpose since the very foundation of the urban centre. The original circuit, which has been largely preserved, can be fully recognized, taking into consideration the following reconstructions and some graphic evidence. The walls follow the coastline posing directly on the natural cliff and then turn towards the Rock to which they tie up in correspondence of its large natural clefts. Along the fortification were four doors: I, “Porta Terra”, in Piazza Garibaldi ; II “Porta Dell’Arena” or “Porta D’Ossuna”, in Piazza Cristoforo Colombo; III on the sea, towards the West, “Porta Della Marina” or “Porta Pescara”; and the last one towards the East, IV “Porta Della Giudecca”. The original structures – well recognizable in the better preserved parts in Piazza Garibaldi, along the descent Paramuro and in Via Porpora – are of those made of big blocks, not cemented with mortar, posed in regular planes, which can be dated from the end of V century B.C. In Piazza Garibaldi the lower part of a tower has been preserved, incorporated in the structures of the Church of S. Maria Della Catena, East of Porta I, the most important access to the ancient town which lead directly to the CARDO MAXIMUS. Speaking of this, we would like to remind that it’s quite meaningful the fact that even nowadays Bishops still take over the diocese of Cefalù in the church “della Catena”. Along the descent Paramuro, in the middle of the thick vegetation inside some private gardens abundant ruins can be found, among which are two turrets. The northern sector of the fortification, in Via Porpora, is the longest and most interesting, besides being the best preserved. Here the walls are directly posed on the cliff according to what the Arab geographer Edrisi had observed: he described Cefalù as a fortress “… built on top of cliffs adjoining the seashore”. In this tract there is the only almost entirely preserved tower: an interesting postern, covered by a monolithic architrave, through which the inhabitants of the ancient town could reach a fresh water spring which gushes at sea level. Inside these walls – besides the numerous occasional findings, such as the mosaic pavement with Cupid riding a swan (I century B.C.) kept in the “Mandralisca” Museum – thanks to the samplings carried out in the Cathedral various ruins of walls have seen the light, and two interesting elegantly paved streets: one (cobble paved) of the Hellenistic age and the other (paved with rectangular flagstones) of the I century B.C. These streets document not only the size of ancient Cefalù and the type of town planning scheme adopted, but also that the most ancient settlement can be dated back to the Hellenistic age (IV century B.C.). The results of the excavations carried out in the necropolis, where nearly three hundred tombs (some of them monumental) datable from IV century B.C. to I century A.D., lead to the same conclusions. 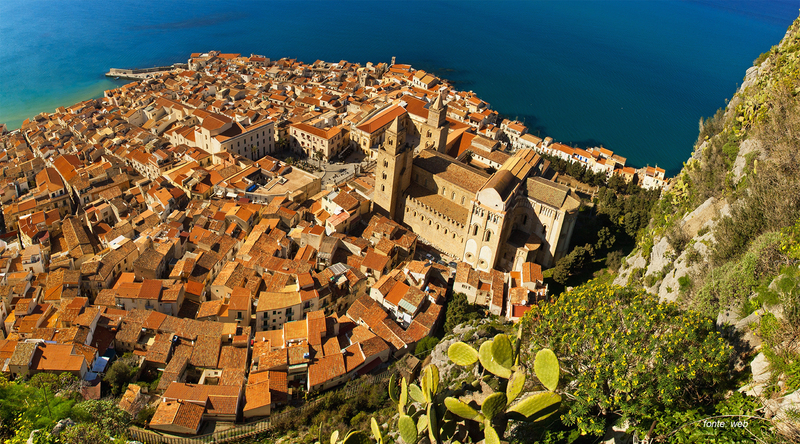 Little traces have been preserved of the medieval town, both because in “rebuilding” Cefalù Ruggero utilized the ancient town planning structure and because its inevitable following readaptations have compromised its integrity. The quarter which has preserved more the medieval look in its morphology is Crucidda-Francavilla, which goes from the Cathedral (North), Corso Ruggero and the Rock. Exactly in this quarter with a peculiar structure a house-tower has been preserved, which can be seen at the end of the alley flanking the small church of the Holy Sacrament. The Cathedral of Cefalù is in Arab-Norman style, and is the most important monument of the town. 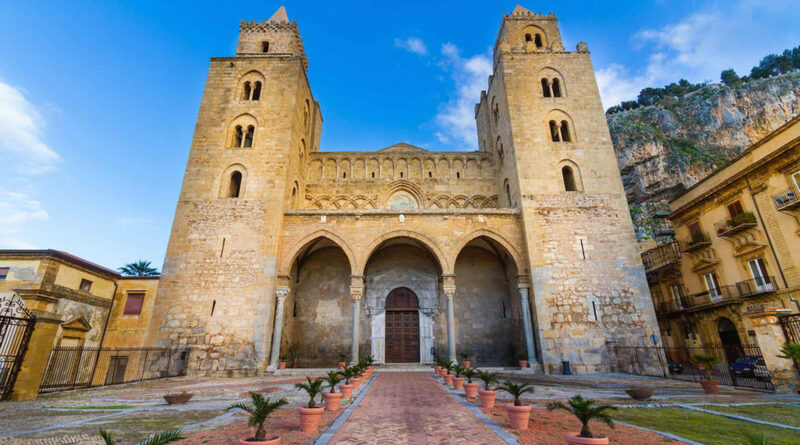 The history of its construction is linked with a legend: King Roger II ordered its construction to thank God for saving him from a storm and making him get ashore in Cefalù. What strikes of this superb building founded in 1131 is at first its massive fortress-like look which is emphasized by the two big square towers on its sides (slightly thinned out by the presence of single and double lancet windows, and completed with a battlemented cusp), by the presence of a crenelation in its southern part, by the frequent drifts and passageways which connect the various parts of the building and by the impressiveness of the structure itself which besides the ancient town dominates all the surrounding zone and is contained between a sea horizon and the wild nature of the mountain. The outside structure is preceded by a square terrace called “turniale”. The façade presents fake small loggias and a central ogival window. In XV century Ambrogio Da Como made the arcade with three arcs propped up by columns which had the original function of protecting the paintings on the sides of which only a pale trace has remained. The arcade is embellished by a white marble arch which has been recently restored. The building of the façade was completed in 1204. The church has a Latin cross plant, divided in three naves propped up by marble columns. The transept has a greater elevation than the naves, even if the original plan provided for a greater hight. In the apses glitters the gold of the mosaics, which were made later, in 1148, by Byzantine workers who managed to blend this ancient oriental decorative tradition with a structure of clear Nordic origins. In the centre of the mosaics stands out the figure of the Christ Almighty. In the two orders below are the orant Virgin Mary, in the centre between the four Archangels, and figures of Apostles, Evangelists, Prophets and Saints. And finally, in the cross vault are depictions of Cherubs and Seraphs. Among the works of art inside the church are : a “Lady with the Child” made by sculptor Antonello Gagini in 1533; some Neoclassical stucco works; and the silver altar of the Chapel of the Holy Sacrament. After the death of Roger II, the church suffered a period of decay, but luckily it hasn’t lost all of its charm and beauty. While touring the town, the “Mandralisca” Museum in the street with the same name is not to be missed at all, a museum that was founded by benefactor and collector Enrico Piraino, baron of Mandralisca. 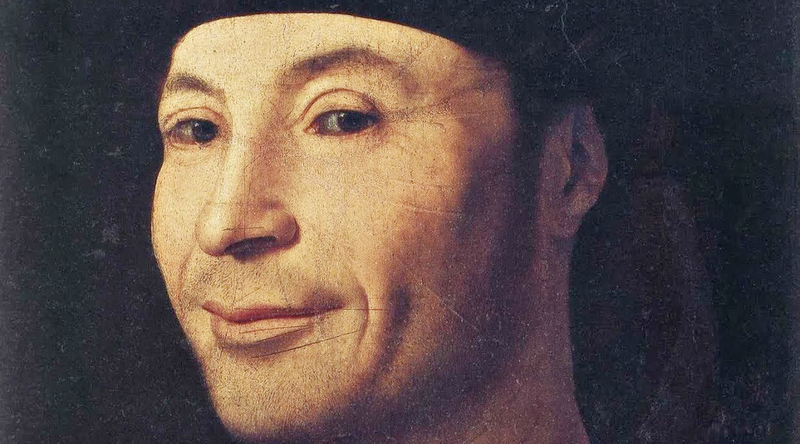 Besides the famous “Portrait of Unknown” by Antonello Da Messina the museum also houses a valuable archaeological collection, whose most important piece is probably the “Cratere Del Tonno” which can be dated back to IV century B.C. Around the baronial palace where the museum is sited is the old town centre, rich also in wonderful churches: the XVIII century architecture of Maria Santissima Della Catena, the XVI century construction of San Nicola Di Bari, and the XVII century Itria in the Medieval church of “La Badiola”. 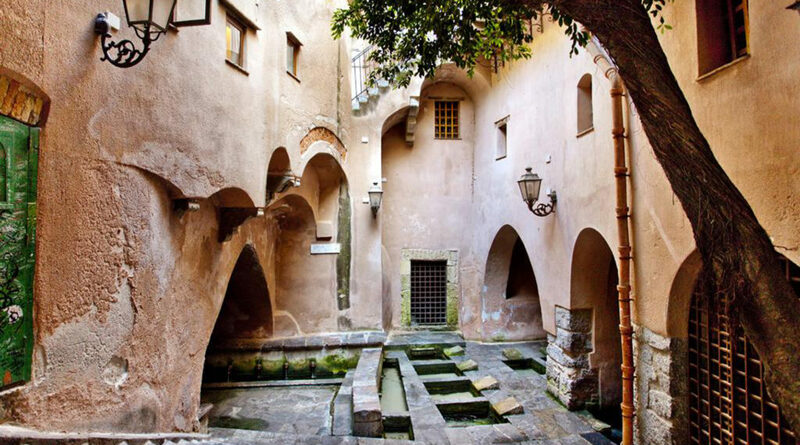 On Via Vittorio Emanuele there is a very beautiful example of Medieval wash-house, which has been in use until modern times. The legend tells that Cefalino generated from the unceasing tears of a nymph who repented having punished with death the infidelity of her beloved. Up to a few decades ago the women of the town still used to go and wash their clothes at these pure running waters, and the echoes of their voices and of their songs full of jolliness could be heard. The site can be reached from a so called “a lumachella” (“snail-like”) staircase, which goes down to a space half-covered by a low vault. The water that flows from the pithead in three walls contributes with its noise to the unique connotation of this environment. Finally, the water that flows inside the pools of the Wash-house reaches the sea through a small hole. The Rock is not only the wonderful scenographic background which characterizes so much the iconographic image of Cefalù, but it is an integral part of Cefalù itself which has developed at its slopes and has drawn from its rocks the building material for the construction of the built-up area. The Rock, a mother, generates and dominates the town and tells part of its history, rich as it is of evidences which have stratified in her in the course of the centuries. 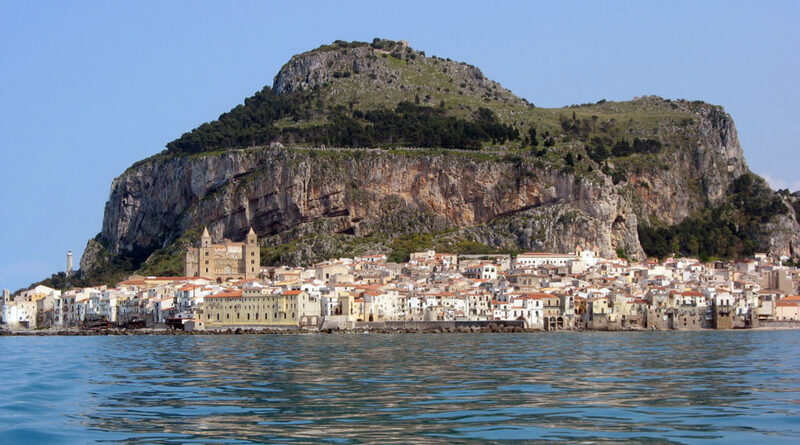 The relationship Cefalù has always had with the Rock strengthens the theory according to which Kephaloidion, the ancient name of Cefalù, comes from “Kefalis”, i.e. “head”, because of the characteristic shape of the Rock. The Rock rises up to 268 mt. above sea level, the Peregrine Falcon still reigns over it, and it still has, in part, its original Mediterranean scrub even if it got destroyed several times by fires; from the geological point of view, the Rock presents peculiarities which have recently been discovered thanks to the modern methods of research: “chemical tracers” have been in fact poured over the peak of mount Carbonara, which have then been found near the port of Cefalù, just in the waters of the spring of Presidiana… this shows that the Rock is connected, underground, with the complex of Peak Carbonara. The 2 August, day of the official start of the festivities, the traditional flag of the Christ Almighty is deployed on the pennant between the two towers of the Cathedral. According to tradition this fact dates back to XVI century, during the free port period. This is confirmed by a 1566 document written during the bishopric of Mons. Faraone, when the customs of law depended on the bishopric. That bishop, with the consent of the Jurymen of the Town of Cefalù, and with the consent expressed by Cesare de Flore “customs officer of the Major Church in Cefalù” granted the “immunitas nundinarum”, the exemption from customs, each year during the solemnity of the “S.S. Salvatore”, for the eight days of the festivities. At the sound of bombardons and as soon as the flag was deployed all merchants could enter Cefalù, from the land or from the sea, “customs free”. Corso Ruggero is lit up by lamps, in the ancient times by “lamparas”, i.e. the lamps of the fishermen. Every morning, the “S. Cecilia” musical band plays marches all along the streets of the town, while in the evening it goes on stage to play the music for which it has become famous. 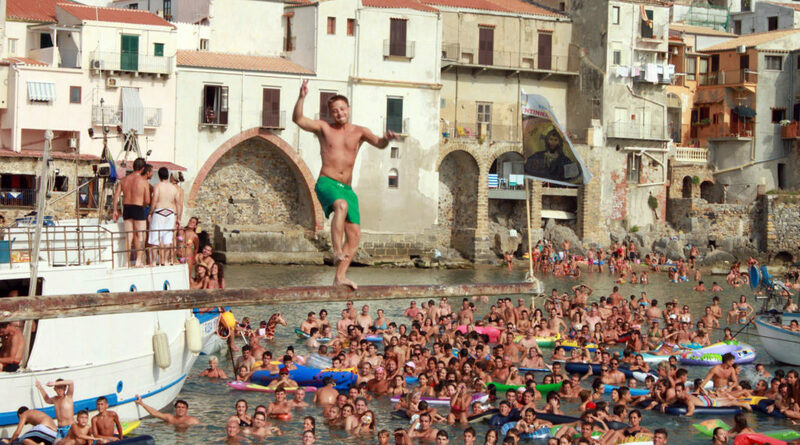 During the afternoon of the last day of the festivities a competition called “Antinna a mari” takes place. This competition, which was wanted by the fishermen who organize,carry out and take care of it, is a competition which in its simplicity holds the very essence of the bond between man and boat, between man and sea. The aim of the competition, to which two categories of players take part (young and old fishermen), is to reach and grab a coloured small flag tied to the point of a very long trunk, which has been made slippery by smearing it with fat and is placed perpendicular to the sea and solidly secured to the dock. Whoever succeeds in grabbing the flag usually emphasises the victory by shouting “Viva il S.S. Salvatore!”, followed by all the attending audience. There is no certain news about the historical origins of this competition. According to the most consistent hypothesis the competition originated from the game sailors used to play on the ancient sailing boats, which had a mast on the prow called of “Bompresso”. Another traditional game is that of the “pignate” (pots). Earthenware pots are placed horizontally to the ground, double the hight of an average man, and inside them there are prizes but mainly water, flour, etc… The participants are bandaged and given a stick, with which they have to try and hit the pots and brake them. To hit the target they climb on the shoulders of a companion guiding them, who is also bandaged. The participant who succeeds in hitting the pot gets its contents. On August 6, finally, the procession takes place and, around midnight fireworks are shot, either from the wharf, from the beach or from the sea. In 2009 there were fireworks shot also on August 4. According to local folklore, “’a vecchia strina” is an elderly charitable woman who during the night of the 31 December brings presents to the good children and coal and ashes to the bad ones, as in other Sicilian towns is done by “the dead”. In the previous day the children are told not to make too much noise because “a vecchia strina du casteddu si ‘nna adduna” (“the old woman of the castle could hear you”): it is imagined in fact that she lives on the Rock. During the evening of the eve the older children walk across the streets of the town playing the “rinali” (tins and broken vases), while the children that go to bed are recommended to keep their eyes closed, if they don’t want the old woman to come “cu spitu infucatu” (“with a red-hot spit”) and burn their eyes.